Anonymous sale, in these Rooms, 16 November 1989, lot 35. This pair of richly-carved mahogany side chairs with their elegant scrolled feet, relate to a group of side chairs with almost identical acanthus-wrapped legs in the Gerstenfeld Collection and attributed to the Clerkenwell cabinet-maker Giles Grendey (E. Lennox-Boyd (ed. ), Masterpieces of English Furniture: The Gerstenfeld Collection, London, 1998, p. 209, cat. 35). The latter set are attributed to Grendey on the strength of their similarity to the suite of seat furniture that may have been bought from Grendey in 1746 by Henry Hoare II for Stourhead. Of course the latter set have open shell-shaped backs and claw-and-ball feet, but interestingly have the same profile of steeply raked backswept rear legs as the present chairs. These may not be especially unusual characterics for mahogany seat furniture of this date, however, it is slightly rarer to find chairs with scrolled feet and it is interesting to note that a closely related set of side chairs, with padded back and seat, leaf-carved legs and scrolled feet, was supplied to John, 2nd Earl Poulett (1708-64), for Hinton House, Hinton St George, Somerset and sold Sotheby's London, 15 November 1996, lot 35 (£89,500). The latter set was tentatively ascribed to the carver and furniture designer Matthias Lock although cabinet-makers such as Benjamin Goodison, Giles Grendey and Thomas Chippendale, who became Lock's employer in the 1750s, cannot be excluded. Perhaps the most intriguing connection with the present pair of chairs is the set of four mahogany side chairs supplied by Vile and Cobb for Anthony Chute at the Vyne, Basingstoke, Hampshire, in 1753 (A. Coleridge, Chippendale Furniture, London, 1968, fig. 27 and p. 176). Their richly carved legs and scrolled feet are so similar to the present pair that it is tempting to attribute them to the same workshop. 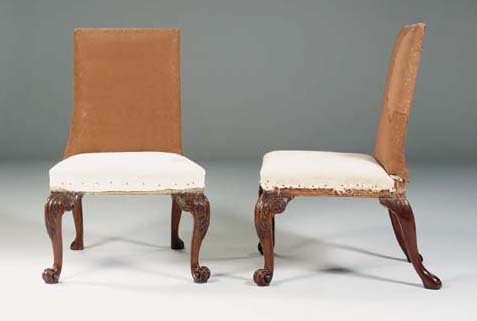 However, this pair are of a quality and similarity to so many chairs of this date that they must have come from the workshop of a leading London cabinet-maker of the 1750s. A set of six similar, but with heavily carved legs and attributed to Grendey, was sold anonymously, Christie's New York, 16 October 1998, lot 32 ($115,200). A further related suite in walnut with acanthus-carved legs and scrolled feet, from the collection of Viscount Leverhulme, was illustrated in M. Harris & Sons, A Catalogue and Index of Old Furniture and Works of Decorative Art, London, n.d., p. 200.